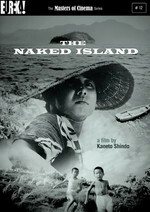 More about Kaneto Shindo and his life and work from Emilie Bickerton in The Guardian. Part of the Criterion on Hulu film club. Available to stream for Hulu subscribers. If you're not a Hulu subscriber, we've begun adding a second film each week that's free to non-subscribers. More info here. Oh, thanks for suggesting this one. I don't think I would have gotten to this without the prompting, but I'm really glad I did. And scenes like the one where the woman is carrying the pails up the hill interspersed with the man watering the crops, so you see the hard-won water just disappearing almost instantaneously into the ground, emphasizing just how small and how fleeting the stakes are, and how futile their life of grinding poverty is. The fact that the significant events in the movie take up so little space in the narrative makes them all the worse, adding to the sense of helplessness and futility and common-placedness of it, mirroring the pail carrying with the coffin, and when the woman has that brief breakdown in the middle of her workday, her grief expressed by spilling a pail of water and pulling out a few plants, which is about as extravagant an expression as she can afford. To put it mildly, I love this movie. It goes up there with “My Favorite Things” and the first movement of Beethoven's Violin Concerto in D major, Op. 61 as one of my very favorite human cultural artifacts, period. I'm glad you had similar feelings about the movie, ernielundquist. I signed up for Hulu because I was tired of the crummy exploitation movies I was getting when I searched for "Japan" on Amazon Prime. This was the second movie I watched after I started my cinema of Japan project back in May, before I had even settled on the post-war theme I'm working through now. (Only 80-something movies to go!) I wrote much of what follows then, but my ardor hasn't changed at all. The life of this little family on a flyspeck desert island is one of never ending toil. All the water for their crops must come — by row boat — from the nearby larger island. The one time they get a windfall, they spend a few hours living modern life in post-war Japan, then it's right back to the Edo period carrying a yoke of water up the hill on their backs. Tragedy strikes, but the next day is just another day and the water must be fetched. The most remarkable thing about this movie is the acting. Especially considering there is essentially no dialogue at all. The Father is the only character that speaks, and he only utters one line almost an hour into the film. It is also beautifully photographed and expertly and artistically scored. Everything is so clear and crisp. The detail captured in small shots like a pine cone floating in the sea or the water for the family's crop slowly percolating into the parched earth really shows the care that was taken. The musical theme haunts me still. There are several layers of messages in this movie. First, and most obvious, is that simple ways do have their charm. The world goes on around the family and their island, but in a very important way they are in but not of it. At another level, Shindo reminds the viewer that simplicity isn't the same as virtue. The two key scenes that convey this are between The Father and The Mother. Early on in the film, we see The Mother struggle to carry water buckets up the hill. After stumbling several times, she eventually falls spilling one of the buckets. (Which, remember, take the better part of an hour to fetch from the nearby island.) The Father stops what he's doing and approaches her. Rather than help her up, or comfort her, or anything else remotely approaching loving, he slaps her across the face and then goes back to his watering. Near the end of the movie, having just suffered an unspeakable tragedy, they are again carrying water. For a moment The Mother rebels against the idea of living this way for the rest of their lives. She purposely tips over a whole bucket of water, then starts tearing the plants out of the ground. She goes on for a few seconds, screaming and crying, then throws herself to the ground, sobbing. The Father stops for a few seconds, looking on with an entirely detached look on his face, then goes back to his watering, making no move at all to comfort his grieving wife. Not long after, The Mother resigns herself to her fate and takes up her watering too. These scenes go to show that simple living doesn't necessarily impart the kind of virtuous humility city folk sometimes associate with it. Finally, there is the deepest meaning. One that might only be fully visible now in the fullness of time. Toil is toil. Doing something every day because you feel like you have to, even if it's killing you, isn't anything to be proud of. No matter if that's gathering water at great physical cost or taking the same train to the same office and doing the same job every day. In any case, I was mesmerized by this movie. It's lyrical and deeply affecting. If you haven't watched it, I promise you it's worth shutting your laptop, turning off your phone, and giving your full attention. I'm afraid I don't have a whole lot to contribute to the discussion, but yay me - i finally managed to participate in watching.